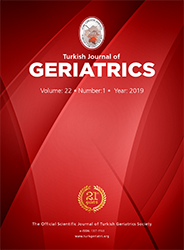 1Hacettepe University, Faculty of Medicine, Department of Neurology, Ankara, Turkey DOI : 10.31086/tjgeri.2019150572 Introduction: To determine the clinical profile of geriatric patients in a neuro-ophthalmology outpatient clinic of a tertiary center. Materials and Method: Retrospective evaluation of medical records from the institutional database, including patients aged ≥65 years who were treated by the same neuro-ophthalmologist, was performed. Results: A total of 99 (52 F, 47 M) geriatric patients were analyzed. Mean age was 72.14±5.26 years. The most frequent complaint was visual loss (48.9%), followed by oculomotor abnormalities (38.7%). Thirty-eight of 48 patients had permanent visual loss, whereas 10 had transient visual loss. Patients with permanent visual loss were older than those with transient visual loss [mean ages of 73.05±5.85 and 68.5±2.84 years, respectively (p=0.022)]. Diplopia was the primary symptom, followed by ptosis in the oculomotor group.